The Enhanced User Experience application is one of the applications that are part of the Managing Fun and Sports Events Use Case or short Event Management. The Enhanced User Experience application aims at providing the best possible experiences to event participants. It is a sensor intensive application that draws from wearables and other sensors with the objective to make event visits for participants unique. 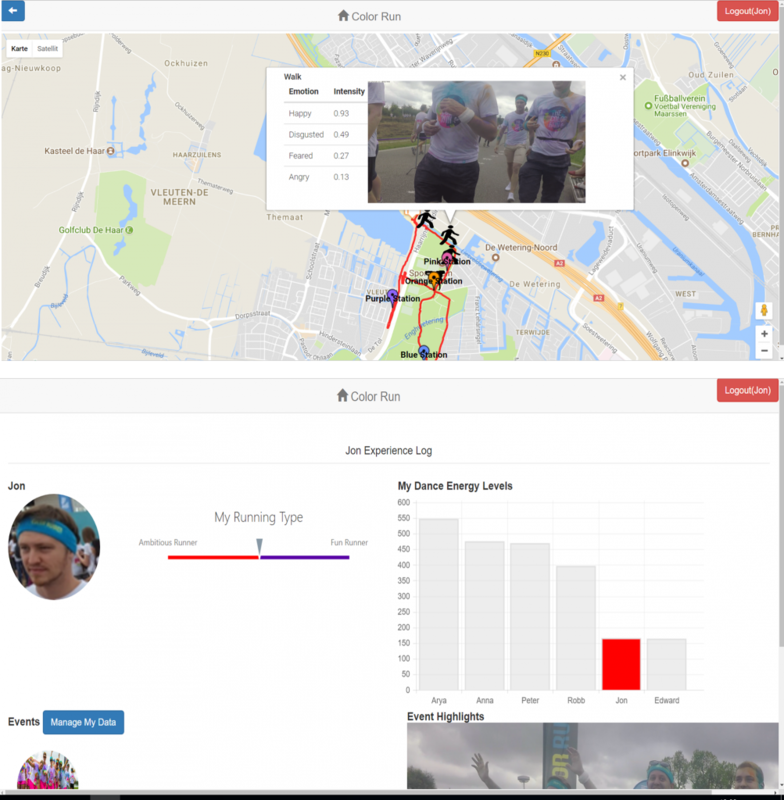 Here we describe the implementation of a first prototype that we implemented based on data collected at a Color Run event that took place in Utrecht on September 11th 2016. The Color Run is a global event series that takes place in many cities around the world including Amsterdam. At the Color Run, participants run a distance of five kilometres and are being sprayed with color on their way. As the event focuses on health and fun rather than athletic achievements the aim for the participants is to reach the finish line rather than comparing the running time with other runners. At the finish line the runners gather to party and dance to music getting sprayed with more color. In order to validate the initial implementations we used data collected from 8 test subjects during the Utrecht Color Run. Figure 1 shows the recognized activities for Color Runner #1. The first line shows all recognized activities. It is clearly visible that there are two blocks. The first block relates to running including the setup of the wearables and approaching the start line. The second block relates to activities during partying. In between the devices were not recording. It can clearly be seen that partying is dominated by dancing and standing activities whereas standing is the main activity during the end of the event. The running activity was accurately recorded: The actual running start for this participant was at 12:40:40 local time (Figure 1 uses UTC, i.e. 10:40:40). Furthermore the results show three instance of walking that we could validate as true positives. Figure 2 shows initial results of our dominant color analytics used for detecting the color stations and their dominant color. The plot nicely shows that color stations can clearly be detected. We have validated the analytic results by checking the actual recorded video. At the purple color station two peaks are visible that resulted from occlusions of the camera as many station were queuing at the color station to receive free gifts (armbands with advertisement).